Wine bar in the heart of Hell's Kitchen. Cute place, but small. Warm and hip host. I was the first to arrive, and was refused seating until all members of my party arrived; host pressured every few minutes to give the status of my remaining party (who was no more than 2 min late). Fast service. Most dishes deliciously savory, but portions were tiny. Because of the demand for tables on a Friday evening, we were (albeit graciously) requested to vacate our table for the next diners. Sharing dishes is the best way to go. Our favorites included pork tacos and duck. Been here before and will return again - love this place! Great food. Tight space. Friendly. Second visit was good. I am sure I will be back. This was a return trip to Kilo and we enjoyed it. The room is long and skinny and has interesting details. Both the beer and wine offerings were not run-of-the-mill and the food is geared to small plate sharing. We sampled the goat cheese crostini, the mussels, and the mushroom tacos and enjoyed all three. Cozy restaurant with a handful of tables including some that are communal style. 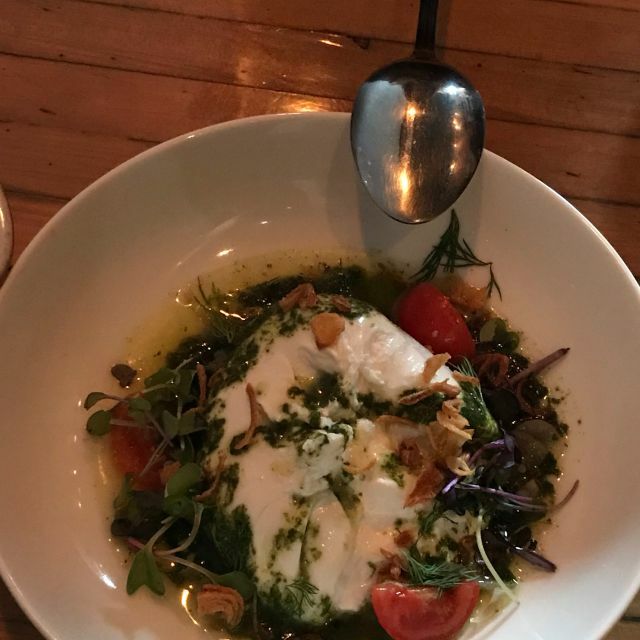 Ordered 7-8 different items including a couple of appetizers (cauliflower, burrata and hummus), muscles, crab pasta, and they were consistently very high quality. The desert was brie cheese with honey, interesting but probably the least standout. Had an interesting selection of beer and wines, though nosebleed pricing ($17 for a glass of red wine). The waiting staff was friendly and quite helpful. We will do a repeat visit. I love Kilo! I go there all the time. The people and the food are second to none! I love the ambiance of this restaurant, along with it's varied menu and outstanding service. We sat in the open front window and enjoyed the pedestrian parade, as many people carefully eyed the content of our creative plates. The tapas food choices are unique and well executed. My favorite was the oh-so-fresh whitefish salad and fingerlings. The new owner knew just what to serve me when I told him I am not a wine fan. Not only did I order a refill, but I took a photograph to remember the Cava! Thank you for a nice evening at kilo! Excellent wine list, creative menu, outstanding service in a cozy/cool environment...perfect for a date night! Wonderful experience - well curated menu with selective wine list that matches food perfectly. Ask for assistance on wine choice (I’m a Level 3 WSET grad and the advice was brilliant). Welcoming small space and service made the evening more than memorable. Brussel sprouts, octopus and special soft shell crab were each prepared simply bringing out great flavours. Thank you! Lovely food in manageable portions. Excellent wine. Good service. Alas very noisy making conversation hard. Everything was excellent, it’s a place I’ll visit again on my next trip to NY. Great food. Superior service. And good setting. What’s not to like? Best restaurant on upper west side. Food seemed a bit burned, although waiter claimed it was caramelized that way. Small, cozy atmosphere; limited, but very interesting variety of tapas-like plates; excellent & eclectic wine. Full meal (4 plates and 3 glasses of wine) for ~$100. Small neighborhood restaurant with 10ish tables and a small bar. Very cool vibe. We had a pre-theater meal and the tapas like menu was perfect. 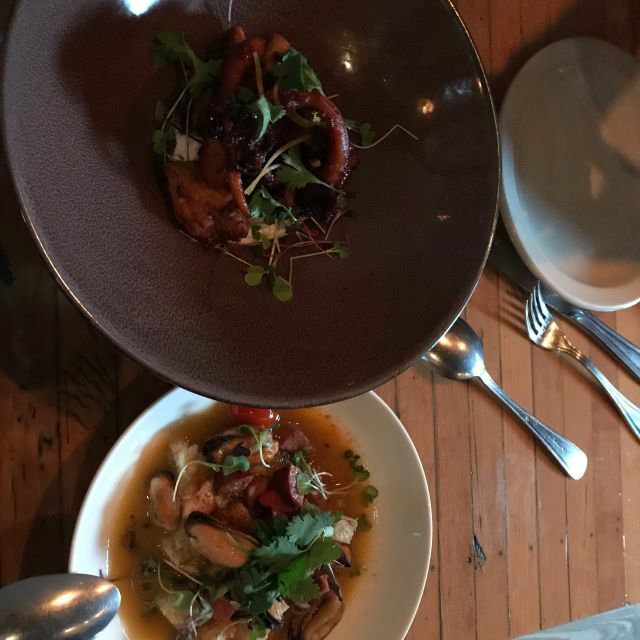 We had the pork tacos, octopus, burrata and duck. The last three were excellent. Service is casual but attentive. Wine, beer and soda (only real sugar sodas that were fantastic) were limited but we liked the choices we made so didn’t need a large selection. The server said they change the menu every few weeks and that makes us want to visit again just to see what they have. Highly recommended for casual, high quality dining at affordable prices. Fun place--very interesting menu-both the drinks and the food. Very tasty mushroom tacos, octopus, broccoli. Friendly, helpful service. Nice vibe. Great evening - we were there with a small group of friends and were taken care amazingly well! The food was delicious and the wine was very excellent. Great service, delicious food, interesting wine list. Well prepared small plates, and attentive service, make for an enjoyable experience in this 9th Avenue storefront restaurant. I love this place. The food and drinks are outstanding every single time I’ve been there. Also the server from Alabama (I forget his name, sorry!) is so passionate and knowledgeable about wine. Every wine suggestion he’s given me has been truly outstanding, and exactly what I didn’t know I was looking for. Great new find in my local neighborhood cant wait to go back! My friends and I had a really wonderful time, allowing our host to work with the kitchen in preparing a delicious 3-course meal with wine pairing - the brussel sprouts were easily the best I've ever had. Friendly, knowledgable and accommodating staff in a low-key, relaxed setting. This was our second visit to Kilo. It was as I remembered it: creative food and an excellent wine list. Our group of four all ordered an appetizer and an entree, and we tried seven different menu items. All were excellent, from the beautifully-cooked Brussel Sprouts with nouc cham to the Octopus. The Horror Show red wine was a hit as well. The ambiance is stripped-down Manhattan brick, a warehouse feeling that I enjoy. However, the noise level was intense when the place was full. We’ve visited twice now and it doesn’t disappoint. The plates are perfect for sharing and so tasty. They have a nice wine selection too. We’ll be back. A real neighborhood gem. The natural wines are awesome and the food is delish! Limited amount of seating, so be prepared for that, however, it's worth the wait! Excellent food and a wonderful bartender. Love this place. LJ is so knowledgeable about food, wine and service. The wine list is careful curated to fit the menu. The plates came out one at a time instead of in groups but if you're up for a slower meal, rather than a rushed after work situation, this place is good for that. Only one issue - we had a reservation for 2 people and they seated us at the bar. When we asked for a table, they told us they didn’t have any available. Amazing. Really love Kilo. No faults. Will come by again. Hesitant to leave a review, because I don't want to not be able to get a reservation next time! So good. Great food. LJ knows more about wine than anyone I know. Delicious. Unique. Impeccable food. 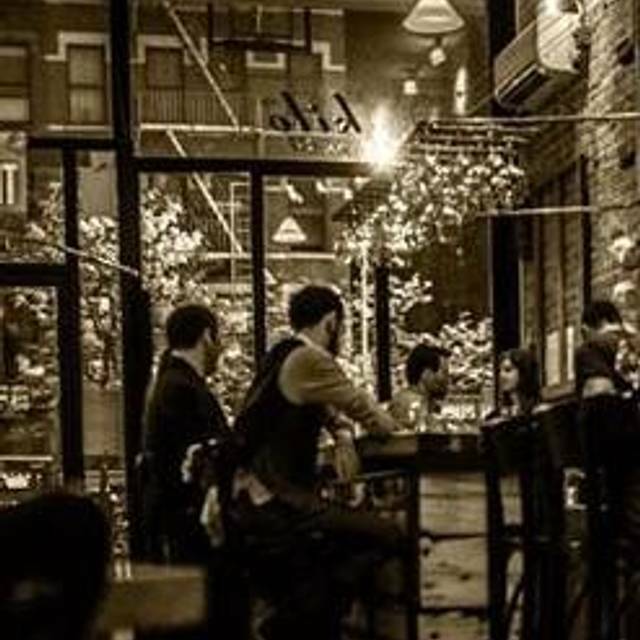 Simple, superlative service in a venue that’s conducive to conversation. The wine list is filled with hidden gems and the staff’s knowledge pairs well worn the rest of the menu. Delightful and delicious as always.